In this article Next Siooon will discuss about Disease Hepatitis, Information includes Understanding - Symptoms - And How to Prevent Disease Hepatitis. Disease Hepatitis - is a condition in which inflammation of the liver, virus or bacteria attacks the internal organs of the liver. There are various types of viral hepatitis namely hepatitis A, B, and C. Because hepatitis consists of several types, this disease has different symptoms and treatments. Very dangerous if left without treatment, because the symptoms of hepatitis can develop into liver cancer if not treated properly medically. Most people infected with hepatitis are not sure how they can get this disease. Moreover, not all hepatitis sufferers will experience the same type of hepatitis as other patients. Hepatitis sufferers just understand that he was exposed to hepatitis when the symptoms of hepatitis have entered the chronic stage. This disease cannot be realized because some people do not experience pain before and even look very healthy. The cause of hepatitis can be caused by a viral infection or not because of a viral infection. You certainly already know if there are several types of hepatitis. The cause of hepatitis A is the hepatitis A. The cause of hepatitis B is the hepatitis B virus, the cause of hepatitis C is the hepatitis C virus, the cause of hepatitis D is the hepatitis D virus, while the cause of hepatitis E is the hepatitis E virus. what appears will vary. However, in some cases of hepatitis, the symptoms appear not because of a viral infection, but because of an autoimmune reaction or because the patient consumes too much alcohol or is exposed to harmful toxins / chemicals. The liver that becomes the place of poison will be damaged because of too much consumption of chemicals. Therefore, from now on do not consume drugs to treat mild pain. Or it's better to try herbal medicines that don't contain toxins or dangerous side effects. - Pain in the stomach. - Jaundice (yellow on the skin, palms, and white eyes). If you feel some things like the above you should immediately contact or visit the doctor to check your health condition. How to treat hepatitis is done depending on the type of hepatitis suffered by the patient. In general, hepatitis sufferers have to take a lot of rest, avoid alcohol, and take medication to help relieve symptoms. Liver transplantation may be needed in liver failure caused by hepatitis B or C. Most people who suffer from hepatitis A and E will heal on their own after a few weeks. Hepatitis B is treated with antiviral drugs, such as lamivudine and adefovir dipivoxil. Hepatitis C is treated with a combination of peginterferon and ribovarin. Hepatitis that does not get good treatment can cause cirrhosis, which is a serious scar in the liver that can cause liver cancer. Visit a doctor when a friend or family member has this disease. There is a risk that you can get hepatitis. As is known, hepatitis can also be caused by infections, viruses, chemicals, alcohol, drug use and other factors. The doctor will provide the best treatment and advice to patients with hepatitis, the patient should follow what the doctor ordered so that the disease can be cured or prevented from getting worse. The hepatitis A virus is found in the feces of an infected person. This disease spreads through contaminated food or water or from sexual contact. An outbreak of hepatitis A was also experienced by several IPB students in early 2015 and claimed 1 life. Because the strain of the virus is very deadly, late handling can endanger a person's life. For information, children who get hepatitis A often have no symptoms, so the infection is unknown. Fortunately, children are now routinely vaccinated against hepatitis A. Most people who get hepatitis A can recover completely within two weeks to six months. This type of hepatitis virus also does not leave liver damage. 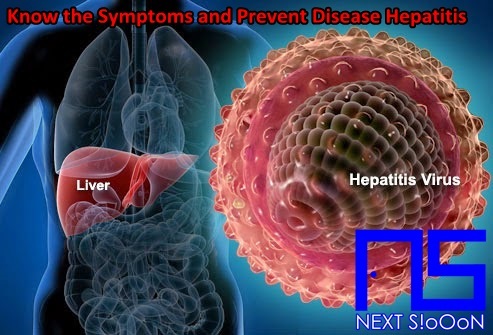 In rare cases, hepatitis A can cause liver failure to death. This type of hepatitis is very dangerous therefore patients must get treatment from a large hospital that has complete medical equipment. It is a condition that is serious and cannot be cured. This chronic hepatitis B will develop into more serious health problems, such as liver damage, cirrhosis, liver failure, and liver cancer. Some people die from this disease. Hepatitis can be prevented by avoiding risk factors and modes of transmission as previously mentioned. In addition, the most effective way to prevent hepatitis is to immunize or vaccinate against hepatitis. This type of hepatitis triggers a very deadly dangerous disease. Maintaining a clean environment is one effective way to keep families healthy. Besides getting healthy, we will also get a sense of comfort because we live in a clean environment. Hepatitis Disease, Hepatitis Disease Information, Hepatitis Disease Article, Hepatitis Disease Information, Hepatitis Symptoms, Causes of Hepatitis Disease, Factors Causing Hepatitis Disease, Hepatitis Disease Impacts, Hepatitis Medication, Relief of Hepatitis Symptoms, Overcoming Hepatitis Symptoms, Hepatitis Disease Symptoms, Hepatitis Disease Management , Things to do with Hepatitis, What is Hepatitis, Definition of Hepatitis, Information on Understanding Hepatitis, Symptoms of Cause and How to Overcome Hepatitis, Hepatitis Detail Info, Tips to Relieve Hepatitis, Tips to Overcome Hepatitis Disease, Overview of Information About Hepatitis, recognize the causes and symptoms of Hepatitis, prevent Hepatitis by knowing the symptoms and causes.